Why raising chickens for eggs is good for mind, body and sprit. Raising Chickens Can Increase Email Volume! It’s a weighty matter! After signing up to receive emails from the Oakhurst Community Garden, I received an invitation to attend the Chicken Symposium in Decatur, Georgia in February this year. Six sessions of information on how to raise chickens, egg production, composting information, how to build the perfect coop and more were offered. Most importantly, it would be a chance to ask some lingering questions and spend some time with a few live chickens. The surprisingly large number of people that attended the symposium looked much like your average city dweller. No one was in overalls (except one of the instructors) or farm boots or smelled like manure. In fact, most of the instructors had “regular” jobs and didn’t live on a farm. These people were interested in growing fresh food without hormones, antibiotics or other nasty chemicals, while at the same time respecting animals and preserving the earth. Brilliant! During registration, I wrote my name on a slip of paper and dropped it into a bowl. There are a huge number of absolutely beautiful breeds of chickens in existence. Some have feathered feet, some have feathered heads that look like dusters, some are small enough to keep in large indoor aquariums! A variety of breeds were presented in this session of the symposium, but my preference in breed was still very basic: friendly, hardy, egg layer. Chicken Coop building ranges from a trash can turned upside down to a full blown poultry Taj Mahal! Chickens need protection, a place above ground to roost, and food and water. Lots of ideas on what my coop would look like swirled through my head as I listened to the instructor talk about building his own coop. One thing was sure: A good portion of the coop would be created from recycled or found materials in the basement leftover from renovating my antique house. Maintenance of chickens is fairly minimal. As a chicken owner, you must gather eggs daily. Cleaning can be done periodically depending on how the coop is built, and the time it takes to feed and water is dependent on the types of containers purchased or built. It seemed about 5-10 minutes a day would be spent caring for the chickens and longer periods of time, but far less frequent, cleaning out the coop. All the information gained at the symposium was extremely useful. However, I was still not ready to move forward. My mother was going through cancer treatments. Would I have time to do this? At the end of the Chicken Symposium, an instructor drew names out of that bowl and, for the second time, I won something related to raising chickens! 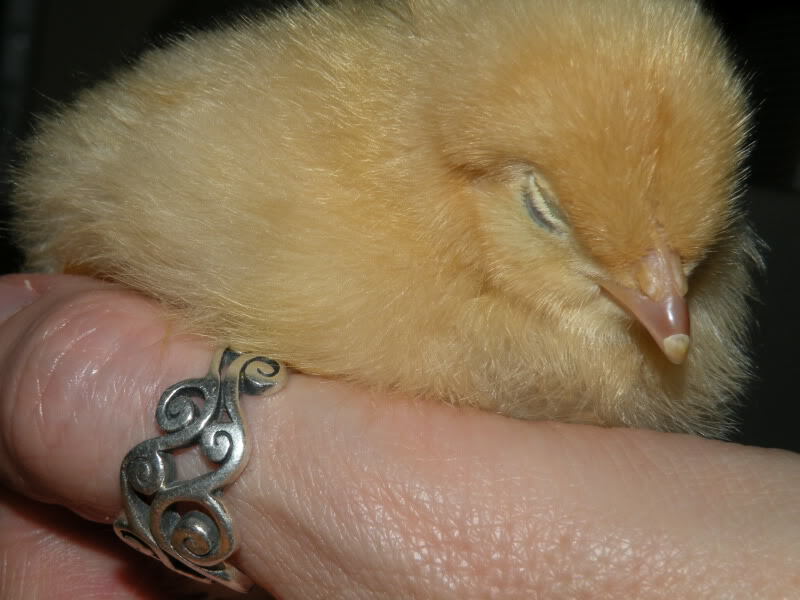 It wasn’t a bag of chicken feed this time…it was six three day old chicks. The decision was made! The righteous man regards the life of his animal.